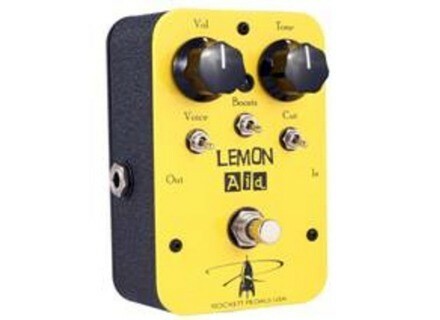 Lemon Aid, Guitar/Bass booster from J. Rockett Audio Designs. Rockett Pedals has released and is now shipping the second design from the new Pro Series Line. 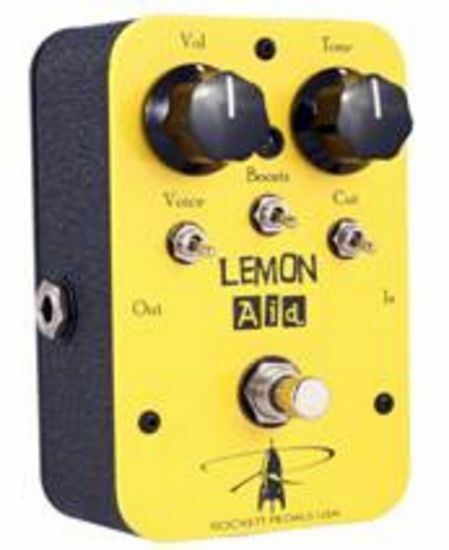 The "Lemon Aid" is described as a "very versatile frequency modifier/boost pedal that offers clean boost, treble boost and full boost." Each boost mode has a thick or thin setting along with an output cut. The pedal offers 21 different voices and is desgined to be "an excellent lead boost." It offers a volume and tone control with no internal clipping, according to RP. The company says they also build them for bass players. All of their pedals are true bypass and "very quiet circuits," they say. Pedal dimensions are approx 4.75" L, 3" W & 1.5" T.
Retail price is $189.00 (US). For more information, visit www.rockettpedals.com. BSM J-Fuzz The BSM J-Fuzz stompbox is described as "a faithful recreation of the old original Jennings Fuzz from the late 60s." Official Manson/Bellamy Signature Guitars Manson’s Guitar Shop recently confirmed the launch of the MB-1 guitar range. V-Pick Releases Psycho Pick This pick is laser cut the same size as the Freakishly Large, and 5.85mm thick.